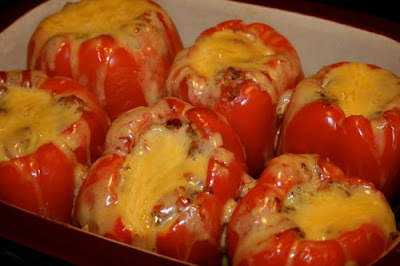 From Catholic Culture: "If you feel brave, try cooking the stuffed raw peppers suggested for today. Mama Margaret probably cooked Peperoni farciti à la Piemontaise (peppers stuffed with boiled rice), a speciality from Turin, for St. John Bosco's boys." Today I'll be making stuffed peppers for dinner in honor of St. John Bosco. I made these last year and even my picky eaters loved them. I hope you try them. They are delicious! Place the rice and water in a saucepan, and bring to a boil. Reduce heat, cover, and cook 20 minutes. In a skillet over medium heat, cook the beef until evenly browned. I stumbled upon this post recently at the decorated cookie blog, which described making "edible candles" using Pepperidge Farm pirouette cookies and making flames using candy melt. I thought they were really clever and would make a great treat for the Feast of the Presentation (also called Candlemas) - as they really do look like candles. I didn't plan to make the candy melt flames so tried to come up with some alternatives. One possibility would just add a pointy dab of orange tinted frosting to the tops. Jessica suggested using a candy corn for the flame - that would work as well. What I ended up using, based on what I had in the house, was tissue paper flames. It's not edible, but it looks good and can just be pulled out before eating the "candle" cookies. The original post creator used a thick cookie with center whole as a base to hold the candle. Using what I had on hand, I hollowed out the center of a small frozen cream puff. A mini donut could be used, too. And you wouldn't need a base if you didn't want one. They could just be held. If you'd like a savory snack alternative that is similar in look, large pretzel rods can also double as an edible candle, topped with a pimento-cheese spread or other orange colored spread. January 31st marks the Feast of St. John Bosco. My family will be celebrating with an Italian Dinner and Movie Night in his honor... I plan on making homemade bread sticks and Skillet Lasagna, just like we did last year. The Skillet Lasagna is really easy and can be made in less than 30 minutes, start to finish! I've also prepared it with other types of pasta (ie: penne, bow tie) in the past, which tastes yummy too. Enjoy! 1. Combine sauce and water in 12" Skillet. Cover; bring to a boil. 2. Meanwhile, wrap noodles in clean kitchen towel and break crosswise into quarters. Stir noodles into sauce. Cover; reduce heat and simmer 16 - 18 minutes or until noodles are tender, stirring occasionally. 3. As noodles cook, place sausage into 10" skillet; cook and stir over medium-high heat 6 - 8 minutes or until sausage is no longer pink, breaking into crumbles. Add pressed garlic; cook 1 minute. Remove from heat. Stir sausage into noodles and sauce. 4. Meanwhile, grate Parmesan cheese. Chop parsley; set aside about 1 Tbsp parsley for garnish. Combine cheeses, remaining parsley and black pepper in bowl. Scoop cheese mixture over noodles. Cover skillet and simmer gently 3 - 5 minutes or until cheese is melted and ricotta mixture is heated through. 5. To serve, sprinkle lasagna with reserved parsley and additional Parmesan cheese, if desired. Tomorrow, January 28th, marks the feast of one of the greatest Doctors of the Church, St. Thomas Aquinas. It is also the date on which The Summa Theologica, written by St. Thomas, was originally published. Before 1969, and in the Extraordinary Form of the Mass, his feast was (and is) observed on March 7th, the anniversary of his death. 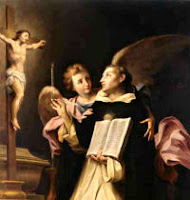 The star, St. Thomas Aquinas' symbol, signifies the divine guidance given him in his work. A chalice and host are also used as symbols. A star cake-tin and a star cookie-cutter, or a sunburst dessert mold are a delight to a child who likes to help prepare nameday dessert; small children may cut out stars or stick gummed stars on place-mats or paper plates. For dessert you might make a book cake inscribed with our Lord's words: "You have written well of Me, Thomas" (this can be done with "Cake-Mate"). A dove on a book cake, a rosary cake, or a crown cake are other suggestions. Our week is pretty busy, but it shouldn't be too hard to find time to let the children cut-out and bake some star shaped cookies in honor of St. Thomas. I have a bag of Betty Crocker Cookie Mix in the cupboard left over from Epiphany, but here is a yummy recipe from the archives in case any of you would like to join us! Devoutly all his praises sing. To share with glory's special glow. The joys which thy triumphant state hath gained. The twofold crown of glory now is thine. Father: Let us pray. O God, You enlightened Your Church with the wonderful learning of blessed Thomas, Your confessor, and made it fruitful by his holy works; grant us, we pray, both to understand what he taught and to follow the example of his life. Through Christ, our Lord. Congratulations to Mary Ellen, one of our contributors here at Catholic Cuisine, and to the whole Barrett Family! Today they welcomed their eighth baby, Brendan Michael, to their clan. January 25 is the Feast of the Conversion of St. Paul. Since this is a special Year of St. Paul, there is special permission to have the option to celebrate this feast on this Sunday. Normally it would be the 3rd Sunday in Ordinary Time. 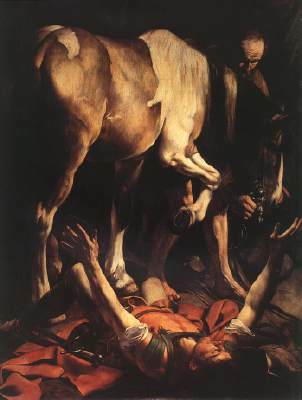 Although the story from the Acts of the Apostles doesn't mention St. Paul falling to the ground off his horse, it seems that is how the scene is always artistically rendered (see Caravaggio's painting above). After all, falling to the ground from a standing position hurts, but it isn't as dramatic as a fall from a horse! Incorporating a horse in the celebration seems most obvious to me. This previous post for Horseshoe Cookies for the feast of St. Martin has loads of ideas for other horse themed foods. There is also Podovy: St. Stephen's Horns which is a filled bread in the shape of horseshoes. How about the Giddy-Up Horse Cake from Kraft Foods? Roast beef and horseradish, one of my favorite combinations would make a nice main course. And how about Garlic Horseradish Mashed Potatoes? Don't forget what we feed the horse! Perhaps a plate of crudités: maybe just celery and carrot sticks with dip. St. Paul followed the Jewish laws strictly, which would mean dietary laws, too. This could be an opportunity to serve a Biblical Jewish meal. While thinking of a personal conversion, the image of a Black and White, those famous New York cookies came to mind. Perhaps bring in the symbols of St. Paul: a book or scroll (for his letters), a sword (for his martyrdom). 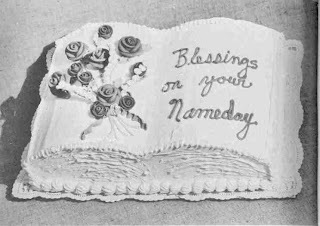 Book Cakes are also appropriate for Doctors and Fathers of the Church (for their writings), and Genoise Book Cake is a delicious sponge cake recipe. One could also use cake pans in the shape of a book. The white chocolate cake used for St. Gregory the Great can also be used for other book cake inspiration. I'm keeping the food celebration simple at our house. I'm making chocolate cupcakes and using two symbols of St. Paul as decorations: sword and scroll. And our centerpiece will include a Playmobil horse and St. Paul (Saul) lying on the ground. Glorious St. Paul, from being a persecutor of the Christian name you became its most zealous Apostle. To make Jesus, our Divine Savior, known to the uttermost parts of the earth you suffered prison, scourgings, stonings, and shipwreck, and all manner of persecutions and shed the last drop of your blood. Obtain for us the grace to accept the infirmities, sufferings, and misfortunes of this life as favors of divine mercy. So that we may never grow weary of the trials of our exile, but rather show ourselves ever more faithful and fervent. Amen. 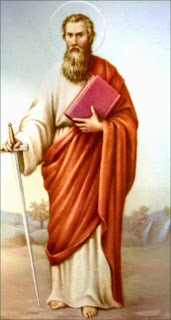 St. Paul the Apostle, pray for us! Today is the Feast of St. Francis de Sales. St. Francis de Sales is well known for his books: Treatise on the Love of God and Introduction to the Devout Life. In addition he wrote many pamphlets and letters. The Church has named him patron of the Catholic Press. Amy Heyd, author of Saints at the Dinner Table, shares the following recipe for Saint Francis de Sales Honey Goodness Breakfast Bars on her website. She says, "These bars remind me of the goodness that radiated from Saint Francis de Sales, as well as the way he remained "sweet" to get people to listen to him." In a large bowl, cream together the butter, brown sugar and honey using a mixer on low for about 2 minutes. Add the egg, applesauce and vanilla and mix for another minute. Sift the flour, baking soda, salt, and cinnamon into the butter mixture. Mix on low for 1 - 2 minutes until the flour is fully incorporated into the mixture. Add the oatmeal and mix on medium until the oatmeal is fully incorporated. Chop the dried apples into 1/4 inch to 1/2 inch cubes and add to the batter. Stir the raisins in with the apples and batter. Spread the batter evenly into a greased two quart baking pan. Bake in a 350 degree oven for 25 to 30 minutes until a toothpick comes out clean when inserted into the bars. To prevent the bars from burning, lightly cover the bars with foil for the last 10 minutes of baking. January 21st is the feast of St. Agnes, virgin and martyr, numbered among the most famous martyrs of Rome. Because of the similarity of her name to the Latin for "lamb" (agnus), the lamb has been St. Agnes' symbol since the 6th century. In Rome on this feast day two lambs are blessed, and the wool from these lambs is used in making the pallium, the symbols archbishops wear as sign of their authority. On the feast of St. Agnes the use of any lamb symbol in cooking could be incorporated as a reminder of this connection. One option is to make a lamb cake, similar to those made for Easter. 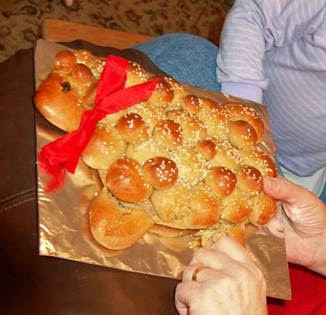 Another idea would be to make these cute lamb cupcakes featured here last March or this adorable Lamb of God bread Jessica posted at Christmas. The Virgen de la Altagracia (Virgin of the Highest Grace) is the patron of the Dominican Republic. The story of Our Lady of Altagracia goes back to the Spanish colonization. Alonso and Antonio de Trejo, brought to the island a statue of the Virgin from their community of Placencia in Spain. The legend says that the image of the Virgin mysteriously disappeared from the house of the brothers Trejo. The statue later reappeared in an orange bush and this is the location where the first church of Higuey was built. Her feast day is celebrated on January 21. The connection to the orange tree is further developed into a lovely picture book by, Julia Lavarez, The Gift of Gracias. 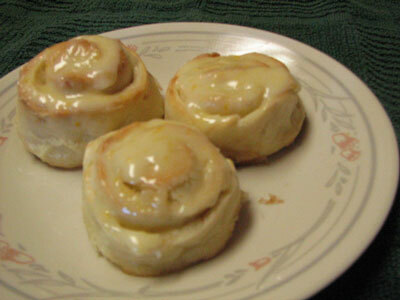 Wake up to a delightful taste of orange with this breakfast sweet roll to celebrate Our Lady of Altagracia. Dissolve yeast in warm water in large bowl. Stir in milk sugar, butter, salt, egg, and 2 cups flour. Beat until smooth. Mix in enough remaining flour to make dough easy to handle. Turn onto lightly floured surface and knead until smooth and elastic. Place in greased bowl, turn greased side up. Cover and let rise in warm place until double, about 1 ½ hours. This coming Saturday, January 17th, is the feast of St. Anthony the Abbot, also known as St. Anthony of Egypt, St. Anthony the Great, and the "Father of Monks." In Catholic Traditions In The Home And Classroom, author Ann Ball mentions that "legend reports that he had to endure severe temptations and that the devil often appeared to him in the form of a pig. 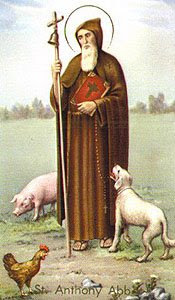 Thus, pork is the traditional fare of the dinner on St. Anthony's feast day." Cooking With the Saints offers a recipe for Olla De San Anton (St. Anthony's Stew) which they say is very popular over in Spain, and attempts "to use as much as possible of the fresh pork." Even though the author has updated the recipe by "eliminating some of the more exotic pork cuts, such as ear or tail" it still contains pork belly and blood sausage, therefore you won't catch me making it. Personally I would be much more inclined to make Rachel Ray's Roasted Pork Tenderloin or Pork Skewers with Pineapple-Scallion Rice. Another option would be to prepare some Monastic Soup or any other recipe From a Monastery Kitchen since St. Anthony was known as the "Father of Monks." Here is a simple recipe in honor of St. Anthony from the aforementioned book. 1. Heat the oil in a soup pot and add the barley, stirring continuously for one minute. Immediately add the carrot, leeks, bay leaf, parsley, salt, and water. 2. Cook the soup over low to medium heat, covered, for 40 to 45 minutes, until the barley is tender. Add more water if needed. For extra taste, add the bouillon and the mushrooms during the last 20 minutes of simmering. Remove the bay leaf. Serve hot. Saint Anthony, you spoke of the importance of persevering in our faith and our practice. Help us to wake up each day with new zeal for the Christian life and a desire to take the next challenge instead of just sitting still. Amen. This coming Sunday is the Feast of the Baptism of the Lord. Since the christian symbol for Baptism is the shell, we can easily tie this into our dinner plans by making a meal with pasta shells. 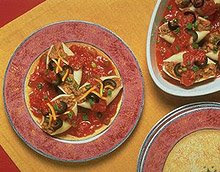 One of my favorite recipes, using jumbo shells, is Nacho Stuffed Shells. I also plan to pull out some sea shells and our children's Baptismal candles, like Mary suggested last year, and light them during dinner. What a perfect time this will be to tell the children about the Baptism of Our Lord and their own special Baptismal days as well! Prepare pasta according to package directions. While pasta is cooking, saute beef in a large skillet until browned; drain well. Add taco seasoning mix and water; simmer 5 minutes or until thickened. Stir in beans and cheese. Cook until smooth and well mixed. When pasta is done, drain well. Fill shells with beef mixture (1-2 tbsp. per shell). Combine picante sauce and tomato sauce in a saucepan. Cook until heated, stirring occasionally. Preheat oven to 350° F. Spread 1/2 cup sauce over the bottom of a 9 x 13-inch baking pan that has been coated with cooking spray. Place filled shells side by side on top of sauce; pour remaining sauce evenly over shells. Sprinkle with olives. Cover with aluminum foil; bake 35 to 40 minutes or until thoroughly heated. Sprinkle with green onions. Cover and let stand 5 minutes before serving. Serve immediately. Garnish as desired. Serves 8. 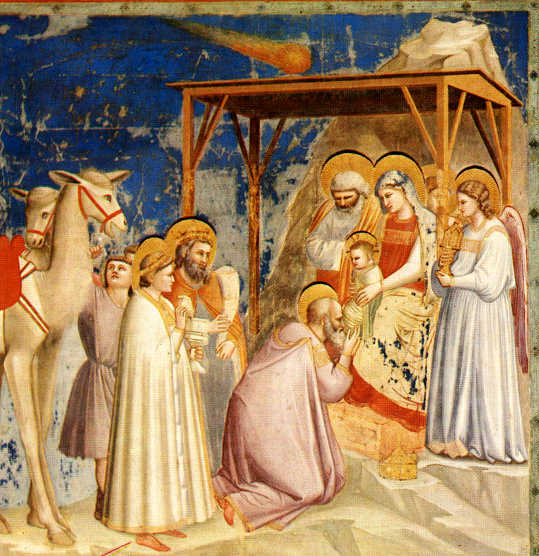 This coming Sunday the Christmas season will come to a close as we celebrate the Feast of the Baptism of The Lord. In her cookbook A Continual Feast, author Evelyn Birge Vitz shares a recipe for making a special treat called Christ's Diapers (Diples). She tells us that, "Diples are "folds" in Greek. These cookies are sometimes shaped in bowknots or other fancy shapes, but for Christmas they are made in a shape suggestive of the swaddling clothes—or actually the diapers!—of the infant Jesus." Even though our Lord was grown when he was baptized by St. John the Baptist, the sacrament of baptism reminds us of infancy. In addition, this feast closes the Christmas season, making these a perfect treat to serve on this special feast. With an electric beater, beat the eggs until light and fluffy. Sift together the flour, salt, and baking powder. Gradually stir the flour into the eggs. Turn the dough onto an unfloured board. 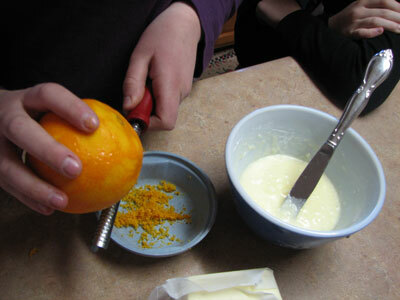 Add the olive oil, a little at a time, and the grated orange rind. Knead the dough until it is smooth—about 10 minutes. Drop the diapers, a few at a time, into hot fat (360º-370º F. on a deep-fat-frying thermometer). Turn once or twice and fry until golden brown. Drain thoroughly on paper towels. Bring the honey and water slowly to a boil in a saucepan. Stir in the cinnamon and lemon juice. Reduce heat and simmer for 1 or 2 minutes. Dribble the honey syrup over the diapers, and sprinkle them with chopped pistachios, then with confectioners sugar. When the diapers are fully dry, pack them in a tin and cover tightly. These keep well, if well covered. I am looking forward to trying out the recipe this coming weekend. Don't they sound delicious?! and that you are able to enjoy these last few days of the Christmas season! Here is a tasty version of the traditional French Kings’ Cake, complete with a hidden feve inside, to celebrate Epiphany. It is surprisingly easy, made with frozen puff pastry and a rich, creamy filling made with either purchased or no-fuss homemade almond paste. And it looks like it came from a fancy bakery! The feve, by the way, is a small dried bean or ceramic figure – we used a little ceramic animal found in a tea box – that is hidden in the cake before it is baked. The cake is traditionally topped with a paper crown: Whoever finds the feve puts on the crown and is King for the Day! In a food processor, process almonds until a fine powder. Add sugars and extract, and blend thoroughly. Add enough water to make a paste consistency. Refrigerate until ready to use in above recipe. Place prepared almond paste into a food processor. Add about half of the sugar, and process until well-blended. Add butter and remaining sugar, and process until smooth; blend in 1 egg, vanilla, almond extract, flour and salt. Set aside. Preheat the oven to 425 degrees F. Line a large baking sheet with parchment. Dust the parchment lightly with flour, and unfold one sheet of pastry onto it. Roll lightly in all directions, from the center out, until you have an 11” square. Using any circular dish or pan that measures about 11” across, trace a circle onto the dough with the tip of a sharp knife. 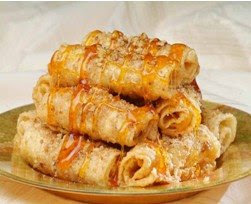 Remove excess dough, and place pan in refrigerator. Prepare second sheet on a cutting board in the same way, dusting with flour, rolling out and tracing a circle. Cover with plastic wrap and place in refrigerator. Take first sheet out of the refrigerator. Place the almond filling over the pastry circle, spreading to about 1-1/2” from the edge. Place the bean or feve into the filling. Remove top sheet from the refrigerator and place atop the filling, lightly pressing edges to seal. Return to the oven and bake for an additional 15 minutes, or until the top is a deep, golden brown. Transfer to a wire rack to cool (I used a cookie sheet to facilitate this). This rich banana bread is filled with treasures -- mandarin oranges, maraschino cherries, coconut, almonds, chocolate chips, dates or raisins -- that remind us of the gifts of gold, frankincense, and myrrh that the three Magi presented to the Christ Child over 2000 years ago. Preheat oven to 350 degrees. Grease two 8x4 inch loaf pans, or 6 or 7 mini loaf pans. In a large mixing bowl, cream butter or margarine and sugar until light and fluffy. Beat in eggs and vanilla. In a separate bowl combine the dry ingredients: flour, baking soda and salt. Add the dry ingredients alternately with the mashed bananas to the creamed mixture. Stir in the mandarin oranges, shredded coconut, chocolate chips, only 1/2 cup almonds, cherries and dates or raisins. Pour into the two greased loaf pans or mini-loaf pans. Sprinkle the top with remaining almonds. Bake at 350° for 50-55 minutes or until a toothpick inserted near the center comes out clean. Cool for 10 minutes before removing bread from pans. Cool completely on wire racks.